The English word zodiac literally means the circle of animals: a zoo-circle. 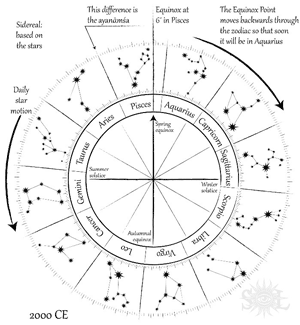 The Sanskrit word for the grouping of the constellations is bhachakra. Chakra means a circle or wheel- the earliest Vedic Saṁhitās saw the movement of the Sun and the progression of time as the turning of a wheel. Bha means light, star, or constellations. The bhachakra is the circle of lights or the wheel of stars. This circle of stars can be divided in an infinite number of ways. I will share some views about the division of these stars and their evolution, and I want to stress that these are views and opinions based on past and present interpretations and translations of various artifacts. 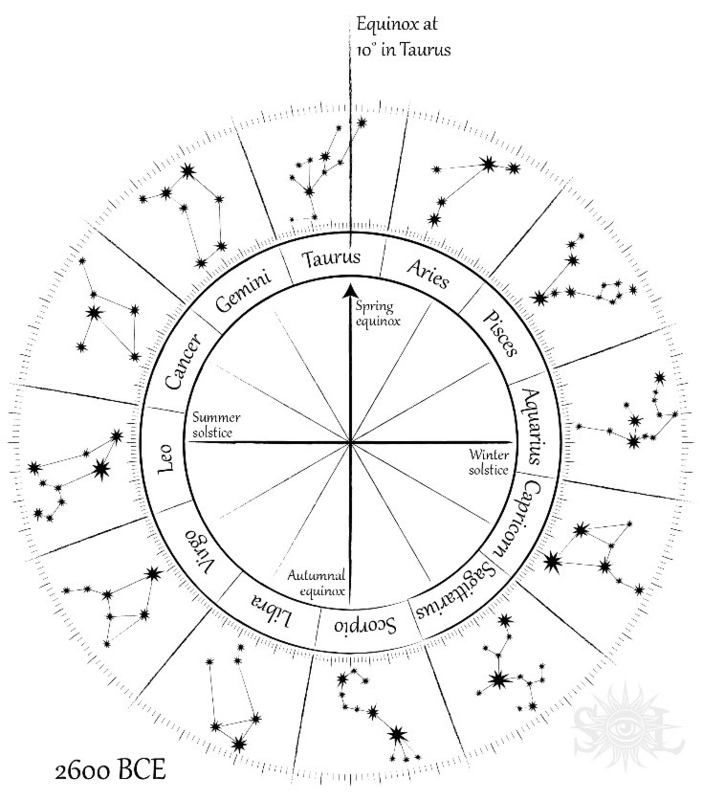 To fully understand the zodiac used in Vedic Astrology, we can compare it with the zodiac most used in the West. Understanding these two zodiacs and their evolution gives us insight into many issues that both have in the present. There are lots of books written on the development of the zodiacs and they have all changed over the years as new data is integrated. What may have been a ‘fact’ forty years ago, is in many cases outdated and no longer true. Perspectives are evolving as Greek and Sanskrit manuscripts and clay tablets are translated and understood. Dating is changing as computers indicate different dates than had been guessed by biased linguistic analysis. Multi-cultural scholars are offering new non-white-eurocentric interpretations. In recent decades, we are getting a bigger picture of the context in which these systems have been evolving. The greatest data we have from ancient times about how the stars were first studied comes from the enduring clay tablets of the Babylonian culture. There are scholars who try to differentiate the Babylonian culture (present day Iraq) from Vedic culture, because of the present state of these places. But archaeology indicates that the Mesopotamian and Harappan civilizations interacted. Vedic religious practice (or Brahmanism) extended from Iran (around the Caspian Sea) to South East Asia. One of India’s most famous astrologers, Varāhamihira, was an Iranian Brahmin (his family had migrated to the Indian subcontinent from the Iranian region). The relationship between the sciences of these two cultures is actually very connected and integrated. In the Babylonian clay tablets we see them observing and recording the stars and grouping them in various ways of seven, eight and twelve signs. We also see in the Vedic texts the grouping of seven, eight and twelve Ādityas (forms of the Sun associated with the twelve months). This indicates a parallel evolution though presently they have been studied only separately in academia. There were many different systems of grouping the stars in the ancient world. The Egyptians were developing a division of thirty-six constellations, the Babylonians were developing a grouping of twelve and Vedic culture was developing a grouping of twenty-seven [which will be the topic of another article]. They most likely all shared some aspect of these systems with each other, but took a predominance towards one- though this is just opinion of this early period, and all we have is opinion based on fragments of evidence. What is clear is that communication and trade was happening between all of them. Alexander the Great did more than just conquer the ancient world, he gave these civilizations an international language. Greek became common from Europe to Northern India. Similar to how English allows for communication of ideas from any culture these days, Greek became a language in which intellectuals could easily share ideas. In this environment, Buddhist teachers as well as other Vedic scholars are mentioned in the courts of Alexandria (in Egypt) and shared the science of the ancient world through the Greek language. The Egyptians, Babylonians and Vedic culture all gave meaning to the various constellations and were all practicing some form of intellectual astrological divination. After Alexander the Great, while the whole ancient world is interacting, we see texts begin to appear which have an intricate advanced system of astrology, with houses, signs, aspects and mathematically developed techniques. The Greeks reference learning from Babylonian (Chaldean) teachers in Alexandria. There is also a reference to Bactria; a place in Afghanistan which had Buddhist stupas, temples to Zeus and the earliest Vaiṣṇava-paṇcarātra temples. The Greeks didn’t have an ancient astrological divinatory system. They used the flight of birds and the entrails of sacrifices for divination. But the shared language between the ancient cultures was Greek, and so much of the astrological terminology is Greek. Whether traditional astrology originally came from one culture or was a mix of various ancient cultures was lost when the Christians destroyed the library of Alexandria and the Muslims destroyed the libraries of the Middle East, Afghanistan and northern India. We have only small fragments of what was before, and maybe future archaeology will reveal more. The traditional system of astrology that we see show up fully developed at this time is using a twelve sign zodiac with each sign divided by three to create another thirty-six signs laid beneath and in India another division of each third into another third, making nine divisions of a sign. There is very little difference between what was being used in Greece, the Middle East and India. Many of the differences don’t have a large impact and are actually complementary. But there is one difference that has a big impact on how we see the stars, and that is the point at which the circle begins. The important factor to understand is that the rising star position on the spring equinox changes over time, and it is called the precession. The spring equinox point is slowly moving backwards through the zodiac at about one degree every seventy-two years. This is the source of many debates. Does the zodiac begin wherever the spring equinox is located or does it begin based on a stellar position? Since this is an area of great debate, every view is coloured by a certain bias. It is impossible to not have any bias, as we all have a background which gives meaning to what we perceive. While we cannot remove our bias, we can at least be aware of it. I am an inclusivist. I believe that if the fundamental aspects (archetypes) of any system relate to reality, then in whatever culture they evolve within, they will be able to correlate to the same archetypes in another culture. In this way, I see everything that has evolved as serving a purpose. That stated, I proceed to speak of the evolution of the zodiacs and precession in the most unbiased way I possibly can. Looking in ancient texts, we see Vedic references to the spring equinox being located in the stars of the Pleiades, which is in the beginning of Taurus [see first zodiac image], and even possible references to a period at the end of Taurus. In Hellenist sources, we see references to the spring equinox at ten, eight and zero degrees of Aries. According to the calculations accepted by the government of India, the spring equinox was at zero degrees of Aries in 290 CE. 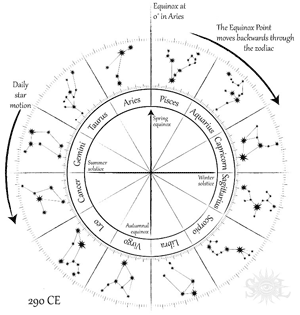 When we look at the 290 CE zodiac [above] we see that the sign of Aries lines up exactly with the spring equinox. From the spring equinox to the Summer Solstice is divided into three parts and each correlate to a sign of the zodiac. These three parts each correlate to approximately one month of thirty days each. In the 2600 BC zodiac, Aries is before the equinox and the constellations and portions of seasons do not line up. In the 290 CE zodiac, Aries is directly after the equinox and lines up with the seasons. Claudius Ptolemy (100- 170 CE) wrote one of the most influential books on astronomy and astrology of the ancient world, in which he defined zero degrees of Aries starting at the spring equinox. Many schools of astrology all over the ancient world, including India, used this as the demarcation for Aries. Not everyone used it, but it became a very popular methodology for the next eight hundred years. 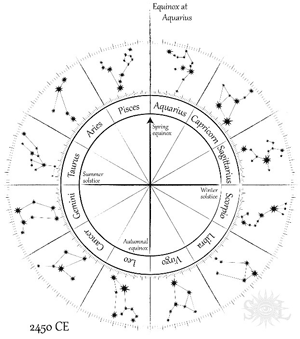 Looking at the present Zodiac below we can see that the present spring equinox is at six degrees of sidereal Pisces, and continuing to move backwards at one degree every seventy-two years. What Ptolemy did was separate the constellations from the sky and attached them to the seasons. As the stars continued to move, those using Ptolemy continued to call the thirty days after the spring equinox as Aries, even though it did not correlate to the stars of Aries anymore. 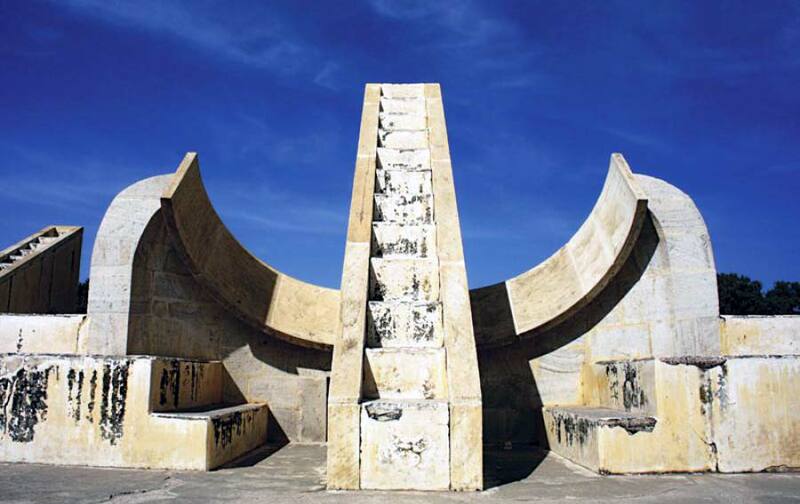 The system that calculates the spring equinox as the beginning of Aries was called Tropical (pertaining to the celestial tropics). In Sanskrit, it is called the Sāyana, meaning with (sa) the equinoxes (ayana). The tropical system basically kept the seasonal positions and stellar nomenclature of the 290 CE zodiac as a standard. The system that calculated the exact star position of the spring equinox and used the exact star position of planets is called Sidereal (pertaining to the stars). In Sanskrit, it is called Nirayana, meaning without (nir) the equinoxes (ayana). In the most ancient texts, we find reference to the sidereal system. After Alexander the Great, we see reference to both sidereal and tropical systems being used in India. The use of the tropical system stops in India by about the tenth or eleventh century. It’s a detriment when people say ‘Vedic Astrology’ and think there was only one system. Through the Vedic texts we see that there were multiple systems in various locations from Iran to Thailand and Bali, as well as different styles even within the same locations. The difference between the two systems is called the ayanāṁśā (portion varied from equinox). The tropical zodiac is sometimes called the western zodiac, but this is a misnomer, as there are western astrologers who use the sidereal zodiac. There are also Vedic astrologers who use a tropical zodiac. Therefore, proper terminology is Tropical (sāyana) and Sidereal (nirāyana). There are tropical astrologers who have tried to prove the sidereal system wrong or outdated. Their argument is that the significations of the signs are based on the seasons and not the stars. There are sidereal astrologers who try to prove the tropical astrologers wrong. Both have a plethora of references because both zodiacs are supported by ancient texts and even clay tablets. In a debate, I could be on either side. The most ancient references are stellar. At the time when the most detailed texts were written the two zodiacs coincided and huge amount of seasonal significations were connected to stellar positions. The planet conjunctions, retrogressions and aspects all remain the same in either system and just the sign which these happen in changes, so a new school of astrology has evolved that doesn’t use any zodiac but just planetary relationships to avoid this debate. As time has progressed, tropical astrologers promote many of the seasonal correlations of the signs. Sidereal astrologers promote many of the stellar significations of the signs. Rules that work get used and passed on. Techniques that don’t work get left out. The two systems have grown apart and put different emphasis on different areas of the astronomical information. My own perspective on the subject is called the ‘Divorce Theory’. Both a stellar and seasonal system existed and were married. They have grown apart and now are going through the pains of divorce. People who only promote tropical or sidereal zodiacs don’t see this as relevant- my theory is as wrong as whatever system they disagree with. But the divorce theory focuses on the fact that when two people get divorced they have to decide who gets which possessions they had previously shared in common. And often both have to give up something they cherish. A recent BBC documentary called western tropical signs wrong and outdated and many articles have spread based on this concept. Those who promote tropical astrology have taken this very personally. The documentary brings out the tropical zodiac’s issue of nomenclature. The signs of the tropical zodiac do not correlate to the nomenclature given to the stars used by astronomers. Tropical signs instead relate to seasons. Soon the spring equinox will move back to Aquarius and it will continue to further grow separate from the stars. The argument used by Tropical astrologers is that the signs don’t correlate to the stars and the star position is irrelevant. The issue with this is that ancient and modern astronomers use the ancient star names and sidereal astrologers use them as well. In the divorce, tropical astrology has lost the names they have used for the signs. The signification they have used for these signs have been developed to bring out the seasonal nature imprinted on an individual at birth (which is not indicated by star names). The tropical zodiac indicates the relationship between the Earth and the Sun, known as bhuvar loka in Sanskrit. The sidereal system utilizes the relationship between the Earth and the stars, known as svarga loka in Sanskrit. It has developed to bring out the imprint of the stars on an individual at birth. They are two different charts indicating two different perspectives. The sidereal zodiac does not show seasonal information. In ancient sacred texts (āgamas and tantras), written when the two zodiacs were married, timing of festivals was indicated sometimes by the zodiac sign, sometimes by the twenty-seven lunar signs (nakṣatras), and other times by the seasonal months. These texts are taken as authoritative, and many religiously won’t question their accuracy. Unfortunately, seasonal festivals are becoming later and later in the year as time progresses and the spring equinox moves farther back in the zodiac. In the Āgamas and Tantras, the Vedic equinox and solstice festivals were tied to the beginning of Capricorn (Makara Sankranti), and presently the Sun enters sidereal Capricorn at approximately January 15th. This makes the winter solstice celebration more than two weeks late. The religiosity given to Vedic Astrology has often required a large social force to create change. 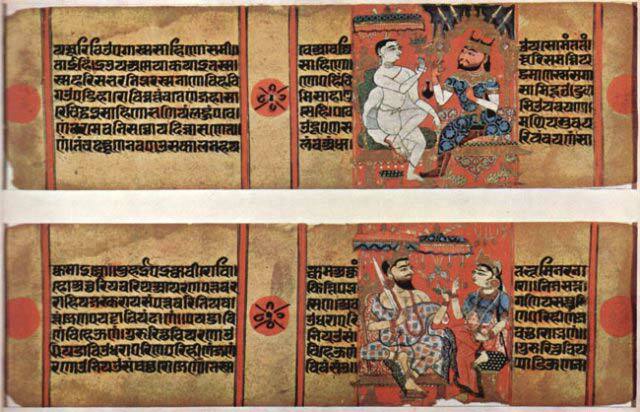 In parts of India in the 1800’s, religious Indians were using slightly off astronomical data from religious texts until modern Indians finally rallied to use the most up to date and accurate data from modern observatories and NASA. To divorce the seasons from the stellar zodiac would acknowledge that the certain religious texts are dated (made in time not by god) and admit its inaccuracy. A larger issue with the change of festival calculations is that there is presently not a comprehensive system to make this change. Promoters of change are either on the side of the sidereal zodiac to not change or the tropical zodiac to change everything and have not integrated the concept of the divorce where two parts of the zodiac can separate their own elements, leaving both to work as functional systems. The Vedic texts have given the names of seasonal/tropical months. 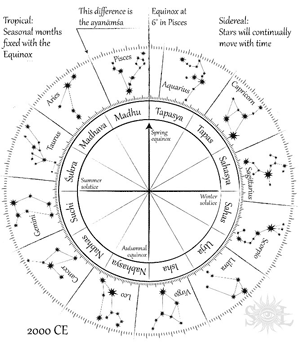 These can be utilized to differentiate the tropical months from the sidereal constellations. This is not an easy task and requires the government to implement. This would be similar to the west moving the Gregorian months of the year into alignment with the equinoxes and solstices; which would make January 1st fall on the winter solstice (presently December 21st). Then tropical Capricorn would become January, tropical Aquarius would become February, etc. A tropical astrologer could then correctly say the Sun was in April instead of Aries. At present though, neither tropical nor sidereal astrologers are ready to part with either aspects of their zodiac, and the divorce will be drawn out for some more time. This article has explained the difference between the two zodiacs. There is not a right zodiac or a best zodiac. Both have utility: one indicating the imprint of the seasonal nature and the other indicating the stellar imprint. Both have growing issues that need to be addressed. 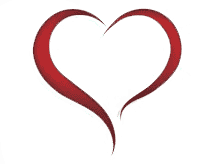 There is meaning all around us and there are different ways to indicate that meaning. The universe is made of consciousness, and we are made of consciousness. Everything is communicating to us and we are communicating to everything. The different zodiacs are communicating to us in different languages. I am a reader of the sidereal zodiac and I respect all those who learn to read the languages of the universe. Eurocentric scholars promoting a colonialist ideology have used Greek terminology as proof to promote that the Greeks (considered Europeans) created astrology and brought it to the rest of the world (including India). A simple map and understanding of the ancient world makes that idea silly. Readers are reminded that India was a British colony until 1947 and that many senior scholars were educated during this time. The last decade has brought about new research by modern scholars who were educated after the Equal Rights movement. In Vedic culture, we see this fully merged with the twenty-seven sign zodiac (nakṣatras) by dividing each of the twelve signs by nine (equalling 3° 20') and each of the lunar signs by four (equalling 3° 20'). The important point is that the major aspects of each civilization are present in the final system and there are no texts of it evolving. Babylonian observations and Vedic and Egyptian time calculations show up as a fully integrated complete astrological system that must have taken either great intellectual feats or hundreds of years to evolve. 290 CE according to Lahiri Ayanāṁśā (which is accepted by the Indian government), 359 CE according to Raman Ayanāṁśā, 221 CE according to Fagan-Bradley, and 560CE according to De Luce.